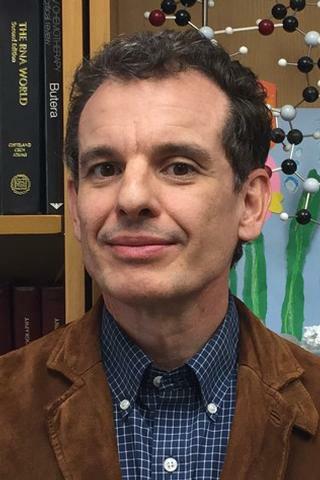 The Wedekind lab uses biophysical, biochemical and cell-based techniques to investigate: (i) bacterial riboswitches, and (ii) lab-evolved proteins that target HIV-1 RNA. The Wedekind lab investigates the mechanisms of action of non-protein-coding (nc)RNAs. We are interested especially in the elegant, three-dimensional architectures of these RNAs, and how they bind to specific small molecules or peptides, leading to conformations that alter biological function. Model systems include: (i) metabolite-sensing riboswitches that regulate protein translation, and (ii) the application of lab-evolved proteins to target HIV-1 RNA. This work is relevant to the development of new antibiotics and anti-retroviral therapies. This work is funded by NIH/NIGMS grants R01 GM063162 and R01 GM123864. Warnasooriya C, Ling C, Belashov IA, Salim M, Wedekind JE, Ermolenko DN. "Observation of preQ-II riboswitch dynamics using single-molecule FRET." RNA biology.. 2018 Oct 17; :1-7. Epub 2018 Oct 17. Dutta D, Belashov IA, Wedekind JE. "Coupling Green Fluorescent Protein Expression with Chemical Modification to Probe Functionally Relevant Riboswitch Conformations in Live Bacteria." Biochemistry.. 2018 Aug 7; 57(31):4620-4628. Epub 2018 Jun 26. Belashov IA, Crawford DW, Cavender CE, Dai P, Beardslee PC, Mathews DH, Pentelute BL, McNaughton BR, Wedekind JE. "Structure of HIV TAR in complex with a Lab-Evolved RRM provides insight into duplex RNA recognition and synthesis of a constrained peptide that impairs transcription." Nucleic acids research.. 2018 Jul 27; 46(13):6401-6415. Author List: Belashov I.A., Dutta D., Salim M., Wedekind J.E.